Pumped hydro storage will eliminate wind and solar intermittency ...really? I'm a big fan of wind and solar if properly sited to minimize impact to wildlife and ecosystems. I'm a fan because I know that nuclear energy can't replace fossil fuels on its own. I'm a fan of nuclear energy because the latest National Renewable Energy Lab study demonstrated that renewables can't do it alone. I wrote this article so that I (and others) can point to it the next time I (we) encounter someone claiming that storage is the answer for intermittency. "The last pumped hydroelectric facility to come online in the United States was in 2002, with the prior facility built seven years earlier. There has been increased interest in building new pumped storage plants, although construction has not yet been authorized. According to the National Hydropower Association, as of January 2012, the Federal Energy Regulatory Commission had granted preliminary permits for 34 GW of pumped storage capacity over a total of 22 states, which would more than double existing capacity. There are, however, significant challenges to building new pumped storage plants, including licensing, environmental regulations, and uncertainty in long-term electric markets. In 2011, pumped storage plants produced 23 billion kilowatthours (kWh) of gross generation—roughly as much as petroleum-fired generation in that year [2 %]. Pumped storage plants, however, consumed 29 billion kilowatthours (kWh) of electricity in 2011 to refill their storage reservoirs, resulting in a net generation loss of 6 billion kWh. " In other words, the relatively few potentially economically viable sites suitable for pumped hydro storage have largely already been spoken for. If pumped hydro were always an economically viable thing to do, all powerplants would have it. There are not anywhere near enough suitable sites to eliminate the intermittent nature of wind and solar power. "Pumped storage plants play an important role in electric load shifting. They typically consume electricity during low-demand hours (e.g., nighttime), helping baseload plants to operate more efficiently by minimizing unwanted cycling on and off (a particular concern for nuclear plants, where cycling is extremely expensive and time-consuming). Subsequently, the gross generation that pumped storage plants put back on the grid is produced when electricity demand is high (daytime). This load shifting helps reduce generation from less efficient and more expensive plants, such as combustion turbines, that would otherwise operate during peak-demand hours." Personally, I can't see humanity reducing GHG emissions in time, so this is largely an academic exercise for me. Because it is unlikely that renewables and nuclear together will be able to replace most fossil fuels in the time frame necessary to prevent the worst impacts of global warming, ocean acidification, etc, anyone who claims to know with certainty, or thinks we should take the risk that one or the other can do it alone has failed to grasp the sheer magnitude of the problem. Nuclear energy kills more birds than wind ...really? "...the numbers in my study are preliminary, first-order guesses ...A final secondary conclusion is that if there is a real “bird killer,” it is neither wind energy nor nuclear power but coal and fossil fuels, especially if you factor in climate change ...I have just started engaging people on Wikipedia to try and correct distortions of my research." Nukes kill more birds than wind? This is a critique of the study that purportedly claimed that nuclear energy kills more birds per kWh than wind. Benjamin Sovacool takes issue with Lorenzini’s criticism of his work. This is a rebuttal of the above critique by the author of the paper being critiqued. Lorenzini rebuts Sovacool’s defense of nuclear bird kill paper as weak. This is a rebuttal of the rebuttal. And finally, read this peer review of the study in question: Bats are not birds and other problems with Sovacool's (2009) analysis of animalfatalities due to electricity generation and its rebuttal. "It estimates that wind farms are responsible for roughly 0.27 avian fatalities per gigawatt-hour (GWh) of electricity while nuclear power plants involve 0.6 fatalities per GWh and fossil-fueled power stations are responsible for about 9.4 fatalities per GWh. Within the uncertainties of the data used, the estimate means that wind farm-related avian fatalities equated to approximately 46,000 birds in the United States in 2009, but nuclear power plants killed about 460,000 and fossil-fueled power plants 24 million." Although the study concluded that nuclear would kill 50 times fewer birds than fossil fueled power plants, it was the claim that nuclear power plants kill more birds per kWh than wind that is being used as a weapon in articles and comment fields to attack nuclear energy. Even if the conclusions were valid (and they aren't), the study still suggested that nuclear is 50 times better than fossil fuels when it comes to bird deaths. Nuclear, being baseload, does not compete with wind and solar photovoltaic, which, because of their intermittent nature, can only be used to reduce the fuel bills of natural gas or diesel peaking and load following power plants which can vary power output to match the fluctuations from wind and solar. The latest National Renewable Energy Lab study found that renewables can only provide maybe a third of our total energy needs, making nuclear the only low carbon technology available to help replace the reaming 2/3 of our energy needs. If we are going to replace fossil fuels, we will need both renewables and nuclear. "... the wildlife benefits from a 580-MW wind farm at Altamont Pass in California, a facility that some have criticized for its impact on wildlife." Some have criticized? Considering that an estimated 1300 raptors (among them 70 golden eagles) are killed annually at the Altamont Pass wind farm, one can certainly hypothesize that the population of common ground squirrels that they prey upon are doing very well (sarcasm alert). A claim that the abandoned Berkeley uranium pit mine kills 300 snow geese per year turns out not to be true, and to make matters worse, it was a copper mine, not a uranium mine. 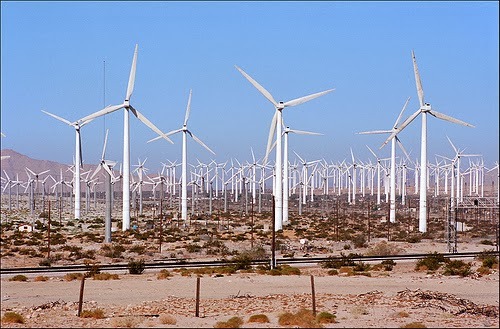 Note that because wind farms tend to be located further from the cities that use their power, they consume far more copper in the form of power lines than nuclear power, which could also be used in many instances to replace coal power plants in existing coal power plant locations, requiring no new power lines. A grossly exaggerated estimate of birds killed when colliding with smokestacks during nightly migrations at a nuclear power plant turned out to be smokestacks used by a coal fired power plant which was co-located with a low-profile nuclear power plant that does not use the smokestacks or nearby cooling tower. And to make matters worse, lights were installed on those coal plant towers which ended the bird strikes. The rest of his data linking bird strikes with nuclear power plant cooling towers shows that they kill ten times fewer birds than his wind estimates. Also, his wind bird kill numbers were about five times too low, making wind 15 times worse than nuclear, and if you include bats, wind kills 20 times more flying vertebrates than nuclear. Had the author included all of the mining that supports wind power and bird kills from all of the extra power lines needed by wind, nuclear would have looked even better in comparison. Photo by Xavier de Jauréguiberry via Flickr Creative Commons. Amory Lovins: "...so hopelessly uneconomic that one needn’t debate whether it’s clean and safe." Joseph Romm: "... too expensive to matter for the foreseeable future." Bill McKibben: "...like burning $20 dollar bills to make electricity." The above solar estimates come from one of several websites that offer estimates based on where you live. These websites are designed for solar contractors to drum up business. They are not going to offer high estimates. Go ahead and click here to get an estimate for your home. Average cost (sans subsidies) of solar for above estimates = $54,242 per home, ($65,353 +$ 39,131)/2. Average cost of a new $9 billion 1100 MWe nuclear power plant per home = $10,078 per home, ($9,000,000,000/893,000 homes). I've always been a big fan of solar ...but damn. That's five times as expensive as nuclear. There's also something appealing about just having three wires coming to my house instead of being personally responsible for tens of thousands of dollars worth of solar panels on my roof. Never mind for now the fact that the nuclear will also produce power 24 hours a day. In addition to the up-front capital costs (see above pictures), utilities will eventually have to start charging you for use of the grid to disperse the electricity your solar power produces. Somebody has to pay for all of those power lines, backup power plants, and transformer stations. UniSource Energy in Arizona for example, which is highly supportive of solar, is one of many utilities that already charges solar panel owners rent for the grid. One fee called the "Delivery Services" would add about $20 to a $110 bill (depending on kWh used) and another fee called "Green Energy Charges" adds roughly $10 more for a total of about $30 per bill to allow your solar panels to share the grid. You will also be stuck with the costs of maintenance when a wire comes lose, or inverter fails, monitoring system goes dead, cleaning, and on and on. If you paid cash, you will be losing the interest that money would have earned, and of course, if you borrowed money, you will be paying interest on it. I may yet put solar on my house, but if I do, it is very unlikely to ever pay off. Other than up-front capital costs, what does "cost too much" mean exactly? In a nutshell it means that it costs more than other alternatives, like natural gas (a fossil fuel that emits 30 times more green house gas emissions than nuclear). Thanks to a great deal of very sound critique from the internet, most (but not all) of the more visible anti-nuclear energy proponents (see above photos) have largely, slowly, grudgingly, abandoned the grossly exaggerated danger and waste arguments against nuclear energy. They now hang their collective hats on the cost argument; new nuclear power plants are more costly to build (capital intensive) than fossil fueled power plants, natural gas in particular. 1) Wind and solar also cost more than fossil fuels. 2) They are only talking about construction costs. Construction costs are irrelevant if the result is a net profit (like rent received on a skyscraper). Although horrifically expensive to build (and horrifically environmentally damaging) Grand Coulee and Hoover dams have been very profitable. This has been true with few exceptions for nuclear power plants as well. What do Lovins, Romm, and McKibben all have in common? Crystal balls. They can see into the future. They are so confident that nuclear power can't produce gargantuan amounts of cost competitive low-carbon energy as it has done for the past half-century, they are (unlike NASA scientist James Hansen, author of Storms of My Grandchildren) willing to bet our children's and grandchildren's futures on it for us. Thanks guys! At the same time they can see the cost of solar going from three or four times the cost of nuclear to ...too cheap to meter? For those who would rather displace nuclear with renewables instead of displacing fossil fuels with them, consider reading the "we don't need nuclear energy because renewables can do it all" argument. A recent study by the National Renewable Energy Lab concluded that it may be possible to replace about a third of our energy use with renewables ...if we can increase by an order of magnitude the use of geothermal, biomass, solar, and wind by 2050. When the NREL demonstrates renewables alone can't displace fossil fuels (on purpose or not), you can pretty much hang your hat on it. Once the use of renewables have maxed out, further reduction in fossil fuel burning will have to come from nuclear power ...or some other low carbon energy source yet to be invented. The internet is rife with websites that will estimate the cost of a solar installation for your home because they want your business. They are not going to give you a high estimate that may scare you away ...if they can help it. But it's only an estimate. For example, they don't ask if your roof slopes the right way or is even big enough. Google "solar cost estimator." I chose one of the sunniest cities (Tucson) and one of the cloudiest (Seattle). Sunnier places will require fewer solar panels. These websites also tell you what subsidies you might be eligible for and go to a great deal of effort to convince you that, over time, your solar panels (like nuclear) will eventually pay off. Typically, to prevent sticker shock, they also, by default, estimate replacement of only 50% of your electrical use. You have to change the default value to 100% to get the full cost. The Seattle installation is eligible for $34,000 in government subsidies. The Tucson installation is eligible for $14,000 worth of subsidies. I mention the subsidies only because there is another anti-nuclear energy argument out there claiming that nuclear energy is more heavily subsidized ...when it actually isn't. Similar arguments apply to solar hot water, which is far more efficient than solar photovoltaic. Although I'd love to put a solar hot water system on my home the next time my water heater needs replacement, I will probably just buy another $350 (low capital cost) hot water tank rather than investing $9,000 or so (high capital cost) for solar hot water. If I were paying a few hundred dollars a month to heat my hot water with natural gas, I just might risk the solar, but we only pay about $20 a month. $9,000 / ($20/month x 12 months/year) = 37 years to break even. $9,000 / ($200/month x 12 months/year) = 3.7 years to break even. Installers always insist that the system will pay for itself over time and go to great lengths to demonstrate how, but they are no better at predicting the future than I am. The safe bet is to buy another $350 natural gas fired hot water tank. Your typical plumber, if called to fix solar hot water problem, is likely to be clueless. The cost of keeping that system running is going to be significant. Likewise, cheap natural gas is also a major reason why investors are hesitant to fund a nuclear power plant which can run for half of a century but, like solar hot water, requires a big investment up front that will take a significant amount of time to pay off ...or not, depending on things like the price of natural gas. So much for capital costs. What other kinds of costs are involved? Nuclear power plants can be profitable for many decades. But nothing lasts forever. Our nuclear power plants are getting old and with age comes higher maintenance costs. Wind turbines and solar panels also get old, and don't last nearly as long as a nuclear power plant. Their day will come as well and somebody will pay a fortune to have worn out panels taken off their roof to the nearest landfill. I'm less of a fan of wind than I am of solar, primarily because turbines too often get placed where they devastate local raptor and bat populations. Never mind what they do to natural landscapes. Does wind also cost more than other alternatives? Google the term "wind too expensive." I stopped looking at 40 pages deep. Why else would investment in wind come to a halt with any suggestion that the wind subsidy should not be renewed yet again (five times and counting)? The British government has set the industry a goal of reducing its costs to 100 pounds ($167) a megawatt-hour by 2020. New Energy Finance estimates it’s currently as high as $246, or 147 pounds, and is unlikely to meet the target. New projects tend to be further from shore and in deeper waters. That means costs are rising, and utilities can no longer afford to shoulder the cost of projects themselves, said Ben Warren, an environmental finance partner at Ernst & Young. Prime Minister David Cameron’s government has set incentives for offshore wind through 2019, hoping to stimulate clean-energy jobs ...Those ambitions are being chipped away as developers better understand the costs of the projects. Utilities have canceled as much as 5,760 megawatts of planned capacity since Nov. 26, when RWE AG dropped its 1,200 megawatt Atlantic Array. Wind (or grid tied solar for that matter) does not and cannot exist as a stand-alone power source. 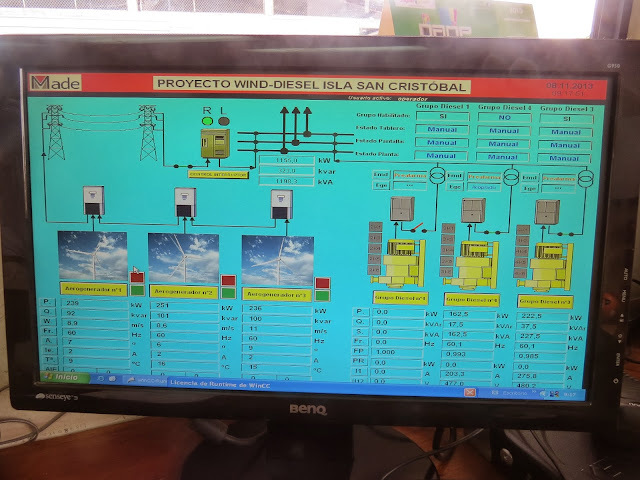 It has to be connected via the grid to natural gas power plants that can take over when the wind dies, otherwise it has no value at all. Because wind turbines are essentially a component of a gas turbine power plant, wind is not really fully renewable. The advantage of a hybrid (car or wind/gas turbine) is that it will use less fossil fuel. The disadvantage is the higher sticker price ($40K for a Volt). Consider reading this well-sourced article: Wind Power Costs in U.S. Are Six Times Higher Than Claimed. 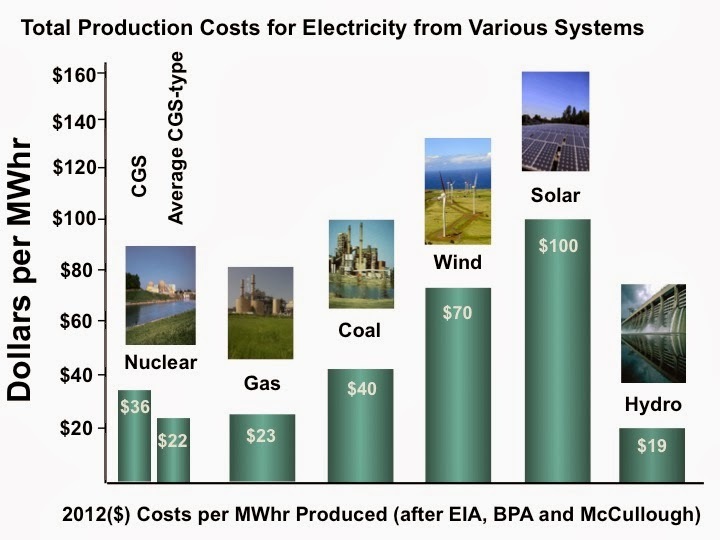 Bottom line; low carbon sources of electricity (nuclear, wind, and solar) presently cost more than electricity produced by natural gas (thanks to the present low cost of natural gas). If nuclear energy deniers throw a party when a utility decides to close a nuclear power plant like Vermont Yankee because it presently can't compete with today's low natural gas prices, they think they are celebrating a victory for renewable energy. In reality, they are celebrating a victory for a fossil fuels. Nuclear energy does not compete with renewables because it is used for baseload power. Nuclear isn't more expensive than wind and solar. If these guys really could predict the future cost of any energy source, they would be worth billions by now. End of story.